The GreenMount School is known for its “Keystone”programs that link the foundations of the school with core academic curricula. These programs, described briefly below, provide critical information within a social context as a means of providing students with a wide variety of opportunities to capitalize on their potential. Environmental Explorations is an open-ended course of study for grades K-8, centering on ecological exploration, and study and understanding of artificial and natural environments. This program employs the guiding principles: Appreciation, Advocacy, and Action. The Explorations program includes camping trips for students in grades 4-8, and outdoor observations and gardening for every grade level. The Apprenticeship Program teaches our seventh and eighth graders responsibility, initiative, and service through real-life work experiences. During the second half of the year, students spend Friday afternoons performing internships at local business and service organizations. Each year our eighth-grade students travel to a remote part of the United States or to another country as part of our Immersion Program. Students are immersed in the destination, learning about the geography, history, and the culture of the people who call that area home. Students generally travel in the spring for 6-9 days depending on the destination and goals of the trip. Recently, students traveled to Iceland to experience the raw beauty in nature and immerse themselves in the study of geology and Icelandic culture. In other years, our students have traveled to the Canyonlands of Utah, Costa Rica, the Netherlands, Scotland, and Spain. Academic preparation includes an independent study project on the country to inform travel and communication. Every Friday students gather in community to explore a topic of social concern, experience an artistic performance, or learn about an aspect of public or personal safety. Community Day is organized by faculty. Students participate in the Community Day programs with their Buddy Group. Each September the students are assigned to a Buddy Group of 2-3 people. The Buddy relationships are encouraging and supportive, and serve to build trust and awareness between age groups. At every grade level students are taught the value of supporting those in need. 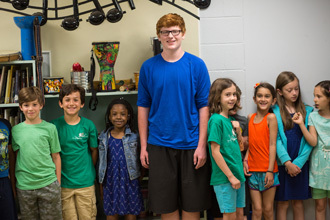 The concepts of service to others are woven into Theme Studies and Community Day, focusing closest to home in the primary grades and expanding the focus to a national or global level in eighth grade. The school has a partnership with Paul’s Place, a community support center in Washington Village. Students in 8th grade volunteer 3-4 times per year. Seventh grade students participate in a two-day Youth Service Opportunity Project (YSOP) in Washington, DC.